Gum Disease, or Something Else? First, if you’re interested in learning how to treat gum disease, you must be pretty confident that you have gum disease. Gum disease, or gingivitis, is only one type of gum disease and it is a mild form of the disease. It’s easy to treat (and we’ll get into how to treat it in just a bit). Untreated gingivitis, however, may advance to periodontitis. Periodontitis is advanced gum disease and comes in many forms, including aggressive periodontitis and chronic periodontitis. It can also appear as a manifestation of systemic disease, or even advance into necrotizing periodontal disease. If you have mild gingivitis, you are probably experiencing red, swollen gums that may bleed after you brush or floss. It’s possible that you have a little case of haliotosis (bad breath). At this stage it’s easy to treat gum disease with proper oral hygiene. If you suffer from periodontitis, you may require additional treatment above and beyond great oral hygiene, including dental visits, scaling and polishing, root planing, antibiotics, or possibly surgery. 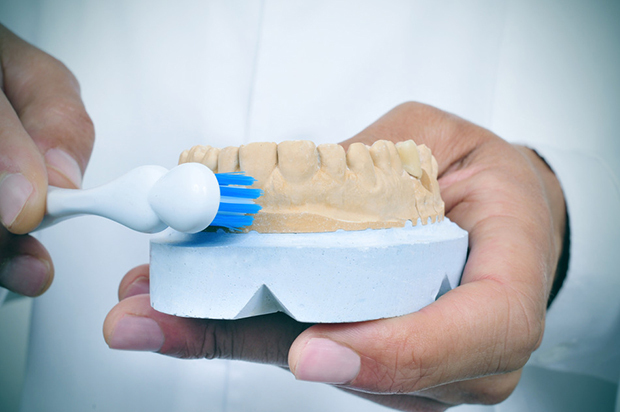 Want to know how to treat gum disease? The basics work well: Brush your teeth for two minutes, twice a day. Use a fresh toothbrush and effective toothpaste along with proper brushing technique. Choose soft bristles – they’ll get into the crevices of your teeth easier than hard bristled toothbrushes. Plus, they’re less irritating on your sore gums. There are several great commercial toothpaste options available today, including toothpastes that target gum health. Most professionals recommend using a toothpaste approved by the ADA that also includes fluoride. For a more economical toothpaste, try a homemade toothpaste made of coconut oil, baking soda, essential oils, and other organic ingredients (get the recipe from this great article about coconut oil toothpaste). Consider a tongue scraper. The combination of a tongue scraper and mouthwash is more effective than a toothbrush at removing bacteria from your mouth. If you can’t brush, rinse. Rinsing your mouth and teeth after meals can reduce bacteria by 30%. 2/3 of people don’t floss, even though flossing is an excellent way to prevent and treat gum disease. Waxed or unwaxed doesn’t matter; it’s more the size of the floss. Too thin and it’s likely to cut your infected gums, so avoid very thin flosses. Some people benefit from floss devices, like a floss threader (this is especially helpful for those with dental bridges). Dry mouth (Xerostomia) means that you don’t create enough saliva to keep your mouth wet, creating a breeding ground for bacteria. You may suffer from dry mouth if you take certain medications, have diseases like diabetes, receive cancer treatments, or have nerve system damage. Treating dry mouth depends on what’s causing the issue, and you should see your physician for guidance. Sip on water throughout the day to help rinse away bacteria before it settles in. Drinking water also helps you to produce saliva, the real germ-buster. Smoking is a huge factor in periodontal disease. In fact, according to research, smoking may play a significant role in over 50% of chronic periodontal disease cases. Alcohol also dries out the mouth and can aggravate – and even cause – gum disease. In a study by Brazilian researchers, it was found that drinking alcohol can have a negative effect on gums and gum health. Researchers also found that the severity of a person’s periodontitis correlated with the frequency of his alcohol consumption. In addition, those who consumed alcohol and suffered gum disease also needed additional periodontal treatment as well. We know that poor nutrition increases the likelihood of infection, which means the opposite must be true – eating well reduces infections. Does this work for gum disease, too? Can you really treat gum disease through your diet? Yes! The Forster Study documents that indeed improving your nutrition does reduce the chance of infection. Gum disease produces mild symptoms, and many don’t even know they have it. By visiting your dentist twice a year, you’ll be examined for gum disease on a regular basis. Periodontal Screening and Recording (PSR) is a procedure that many dentists perform and involves measuring the gum pockets. X-rays are also important if you have periodontal disease, as they show bone loss and other disorders. Not sure if you have gum disease? Schedule an appointment with one of our periodontists in SE Michigan, or call and take the first step toward keeping your smile radiant. This entry was posted in Dental Tips, Periodontal Disease and tagged gum disease treatment. Bookmark the permalink. Follow any comments here with the RSS feed for this post. Both comments and trackbacks are currently closed.